Phillip Phillips had his own house in order. He’s the leader, but he’s not a figurehead. He leads by example. He plays and sings, matching the same effort, precision, and commitment of his team. His expression indicated that he was lost in the moment of doing his very best guitar playing, especially when he wasn’t singing. This is not a “do as I say” unit. 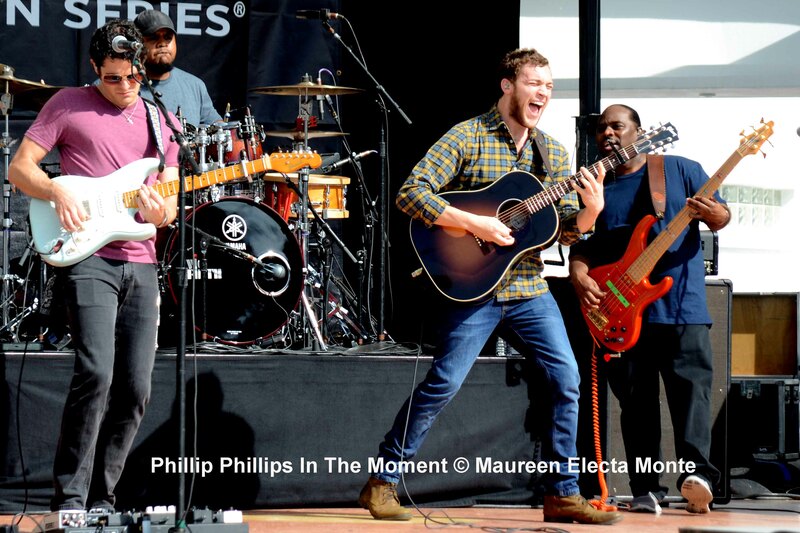 Phillip Phillips reflected the spotlight on his team. He didn’t act at all as if this was all about him, even though few in the huge crowd in Forsyth Park (and certainly not me) could have named the band members. With EVERY SINGLE SONG, the band jammed through some really awesome instrumentals, allowing the trombone player, the drummer, the lead guitarist, the bass guitarist, the bass fiddle, and the keyboard player to shine, and shine well. This wasn’t a swift, 3.5 minute rendition of “Gone Gone Gone”. They jammed for a good seven to ten minutes on each song, even the hits. The audience loved it. I loved it. 3. 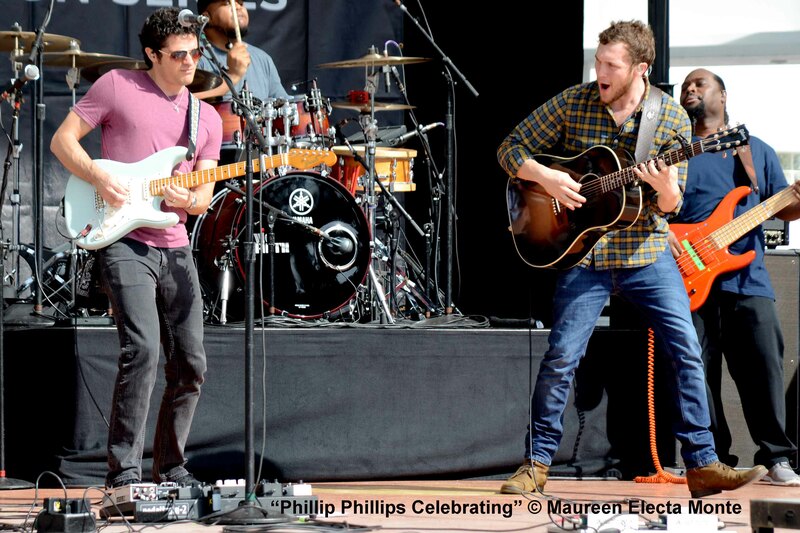 Phillip Phillips celebrated their awesomeness. When the bass fiddle dude was killing it, Phillip Phillips turned his back to the audience and watched, adding to the energy by playing his guitar with emphasis that matched his colleague, stomping his feet, and even at one point, levitating (I have proof below!) He was totally into how cool and talented his team was. If the drummer was delivering a wicked solo, Phillip would glance at the keyboardist, with a big smile on his face, and they would nod, as if to say, “Oh yeah, Jerry is hot tonight!” And Jerry was. When Jerry would glance at Phillip after the completion of his solo, the two would laugh at how well Jerry had played. It was a private “high five!” moment between the leader and his individual teammates, but it was publically delivered, which was even better. Phillip called them out by name more than once. 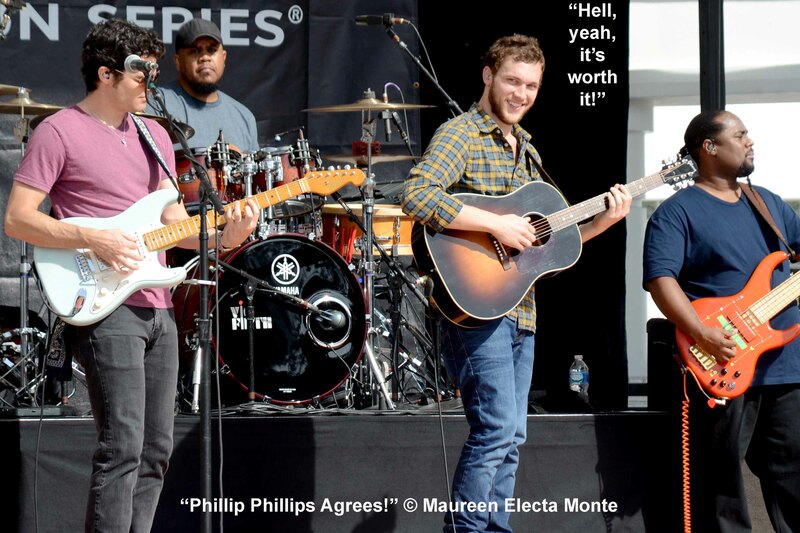 In all three situations, Phillip Phillips was true to himself. He was entirely authentic from start to finish. From the collaboration with his team, to his appreciation for being invited to play, and through his interaction with fans, there was not a single false note of insincerity (I’d love to know his Strengthsfinder profile!) He was humble, happy, and effective. I walked away with new appreciation for him, his band, and for their decision to follow the road less traveled. Let’s face it – the winner of American Idol has lots of choices. 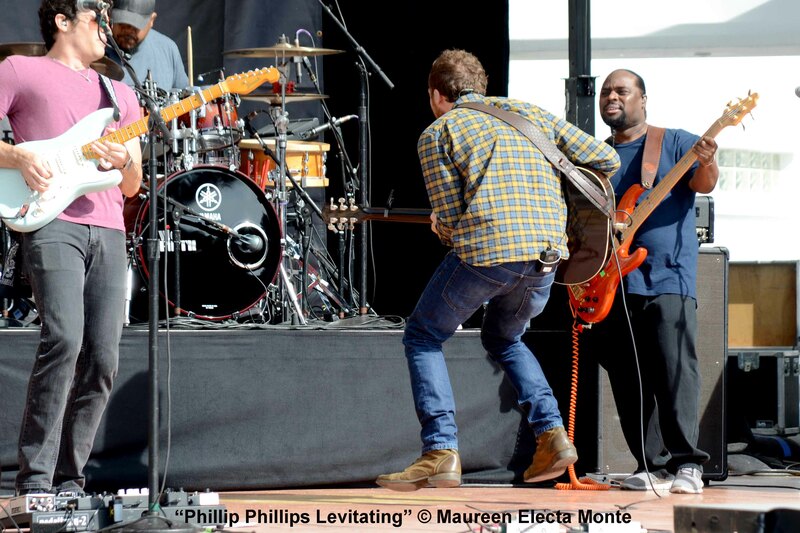 Phillip Phillips has chosen to jam with his band, not use them as “lucky to be on the road with me” background props. In an article in the local newspaper, he spoke about his new album. He chose to jam on that as well, and allow the instrumentals to add to the special sauce of his creativity. That’s a risky move in this ADHD world we live in. In addition, when on the road, Phillip mixes up the play list. Not only do he and his team have a different list of songs every night, it’s in a different order. This keeps the team fresh and engaged. It’s more fun for him and his band. Anytime you have a rock star performer (in music or in your organization) that is encouraged to deliver their goods in a fresh manner, you will drive up engagement. People enjoy working with other talented people having fun and doing what they do best. Audiences (and clients!) love it, too. Can we remember to keep our “own side of the road clean?” Can we give credit where credit is due? Can we celebrate success with the talented folks we work with, in a manner that is enjoyable for them? (Note: Phillip Phillips reminds us that frequent, personal, and small celebrations have a greater impact than an annual big bang award with just one or two people). These three leadership behaviors take time and focus. We live in a society where time is a precious resource, and focus is an extinct genetic mutation. Speaking for myself, I find that I am busy, moving swiftly, multi-tasking, anticipating the next problem (work, child, home, school, family, the holidays). Therefore, I don’t always exhibit those three awesome leadership behaviors. This makes me a less effective leader. HE SAYS YES! THE CROWD GOES WILD! :-=) What do you think? Maureen – Ideation, Strategic, Learner, Achiever, Individualization & Maximizer! Love this. What fun! Love how you’ve combined your love of music, photography and leadership here. What’s uniquely YOU is showing, my friend, and it looks really fantastic! Of course, you knew I would really like this post- it has an element of celebration in it. (By the way, I found myself celebrating how much you are now celebrating these days! :)) I hope you are having lots of fun in Savannah! Hi Vicki! Thanks so much for enjoying my fun with me! :-) This post DOES have an element of celebration – I wonder if Mr. Phillips understands that I’ve stopped by to celebrate with him? :-) You taught me that, of course. And I continue to celebrate here in Savannah… all good. It is pouring rain this morning- making it a perfect time to catch up on email. :-) Talk soon my dear friend! Onward!